Built in 1935, the Ledford Center is a historic mainstay. Once home to the Wake Forest College, it has become the hub of Southeastern student activity. Find out more here! Southeastern is committed to providing a balanced Christian approach to counseling. Our goal is to provide counseling and guidance that meets your specific challenges and at the same time honors Christ. Here you can find important forms to help us ensure your safety and to better our campus. Intramurals at Southeastern provide students with the chance to stay fit while enjoying some quality competition on campus! The Southeastern Disc Golf Course features a 9-hole disc golf course that is available to SEBTS members with a valid SEBTS ID card. Student activity groups at Southeastern help encourage spiritual growth and promote fellowship for the seminary and college community! The Share Shop is a free resource to Southeastern students consisting of donations (such as clothes, kitchen items, etc.) from the Wake Forest Community. Search for jobs from various businesses in the area or ministry positions in churches and organizations across the country! Magnolia Kitchen is our dining experience on campus. From a quick snack to a nice dinner Magnolia Kitchen is the way to go! Southeastern provides an on-campus Health Center for students, faculty, & staff and their families which offers medical care, massage therapy, & chiropractic services. The Locker is your one-stop shop for Southeastern apparel, along with mail & copy services including photocopying, binding, & faxing. 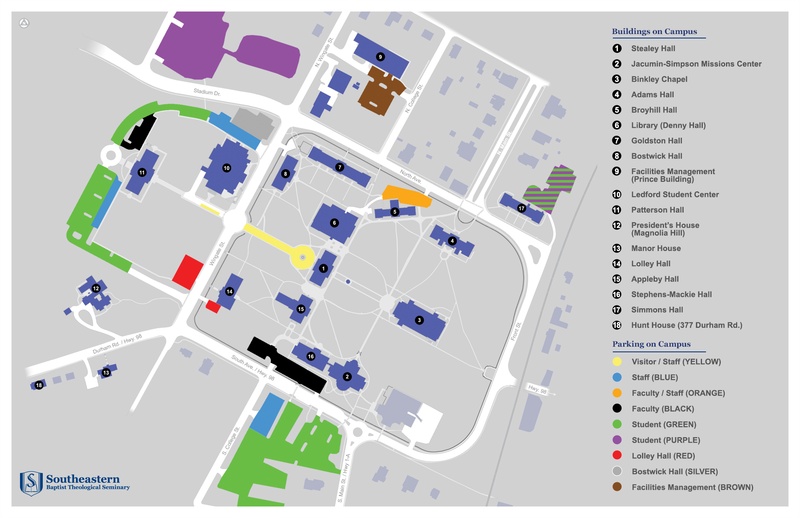 Download the Southeastern campus map for your personal reference! Find out everything you need to know about local events of interest taking place off-campus in and around Wake Forest!